An Upward Mobility Campus, UMC, is what Breakthrough Outreach/Shelters Network proposes to help solve homelessness in Silicon Valley . 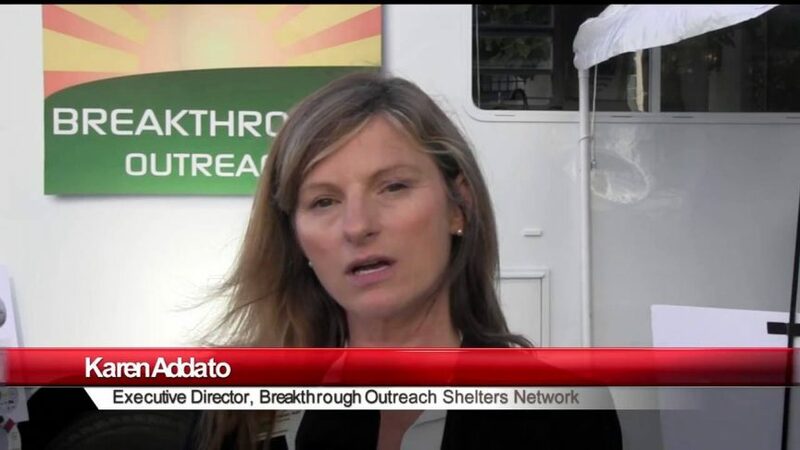 Breakthrough Outreach/Shelters Network Executive Director, Karen Addato, talks about their multi-prong approach to providing shelter and assistance. This approach builds upon the High-Tech Rover mobile outreach solution and provides different levels of support, based on need. Addato is looking at an entry level, temporary housing package – what she terms a bronze package – that could serve up to 300 people per month at $7 per person per day with start-up costs of $150,000. The silver package provides more privacy via pop-up tent camps. Permanent, supportive micro-layout housing is the final step in her plan and the design will accommodate up to 700 people on two acres of land. R.O.V.A., a mobile app, ties together member and sponsors with the various aspects of the proposed programs. To date, sponsors of the Hi-Tech Rover have included individuals, faith-based organizations and corporations, such as Adobe. Addato indicates that more of these sponsorships will be needed to bring the vision she describes above reality. Note, this was filmed June 9th, 2016 outside the San Jose City Hall.